A lot of care went into the James Bond themes in the early days. And I have to say, the quality was still there in the Nineties, although some of the tracks released in the Eighties and Nineties relied on cliche a little too much. But with the latest Bond movie, 'Quantum of solace', nothing really is Bond anymore - and the theme song went the same way. 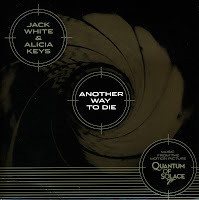 'Another way to die', performed by Jack White and Alicia Keys, sounds like a hastily compiled demo, in which the writer, Jack White, forgot to include a melody and a comprehensible song structure. On the plus side: it's the first time since Madonna's 'Die another day' that the Bond theme appeared on the 7" vinyl format again and it is pressed on semi-gold coloured vinyl.